Today we are excited to announce the public preview of Azure Premium Blob Storage. 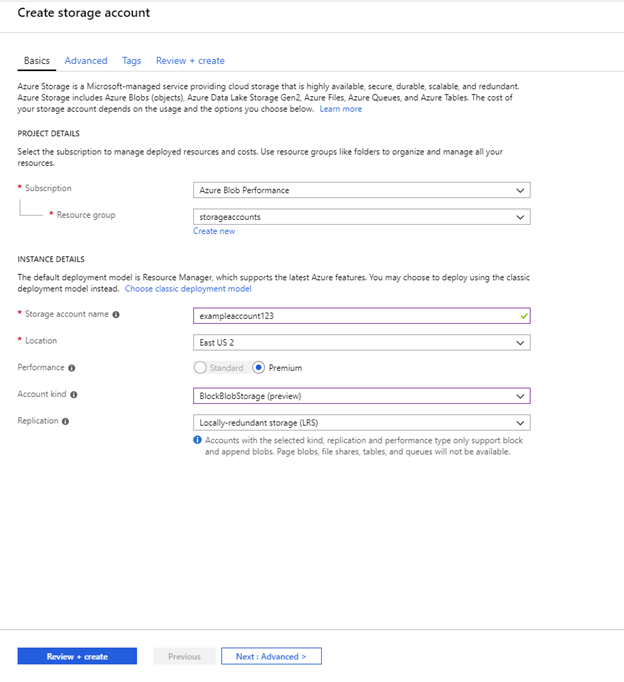 Premium Blob Storage is a new performance tier in Azure Blob Storage, complimenting the existing Hot, Cool, and Archive tiers. Premium Blob Storage is ideal for workloads with high transactions rates or requires very fast access times, such as IoT, Telemetry, AI and scenarios with humans in the loop such as interactive video editing, web content, online transactions, and more. You can store block blobs and append blobs in Premium Blob Storage. To use Premium Blob Storage you provision a new ‘Block Blob’ storage account in your subscription (see below for details) and start creating containers and blobs using the existing Blob Service REST API and/or any existing tools such as AzCopy or Azure Storage Explorer. Premium Blob Storage has higher data storage cost, but lower transaction cost compared to data stored in the regular Hot tier. This makes it cost effective and can be less expensive for workloads with very high transaction rates. Check out the pricing page for more details. Premium Blob Storage public preview is available in US East, US East 2, US Central, US West, US West 2, North Europe, West Europe, Japan East, Australia East, Korea Central, and Southeast Asia regions. At present data stored in Premium cannot be tiered to Hot, Cool or Archive access tiers. We are working on supporting object tiering in the future. To move data, you can synchronously copy blobs from using the new PutBlockFromURL API (sample code) or AzCopy v10, which supports this API. PutBlockFromURL synchronously copies data server side, which means that the data has finished copying when the call completes, and all data movement happens inside Azure Storage. Once you have created the account, you can manage the Premium Blob Storage account, including generating SAS tokes, review metrics, and more. To create a block blob account, you must first install the PowerShell AzureRm.Storage preview module. Step 1: Ensure that you have the latest version of PowerShellGet installed. Step 2: Open a new PowerShell console and install AzureRm.Storage module. Step 3: Open a new PowerShell console and login with your Azure account. New-AzStorageAccount -ResourceGroupName <resource group> -Name <accountname> -Location <region> -Kind "BlockBlobStorage" -SkuName "Premium_LRS"
az storage account create --location <location> --name <accountname> --resource-group <resource-group> --kind "BlockBlobStorage" --sku "Premium_LRS"
We would love to get your feedback at premiumblobfeedback@microsoft.com. 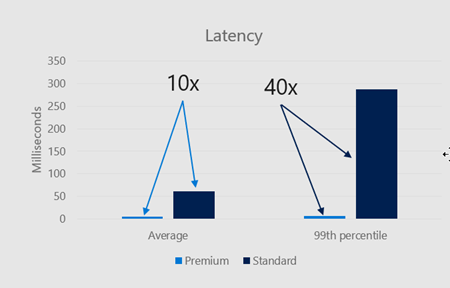 We are very excited about being able to deliver Azure Blob Storage with low and consistent latency with Premium Blob Storage and look forward to hearing your feedback. To learn more about Blob Storage please visit our product page. Also, feel free to follow my Twitter for more updates.